What can you even say about this game? Well, to even call it Major League Baseball is an embarrassment on multiple levels. The Twins played very poorly, there was an epic ump show and things wound down with Chris Gimenez on the mound. What do we even call this? Total system failure is already taken. In the sixth inning, Matt Belilse made his first appearance since being activated off the disabled list. He threw three pitches, the last of which hit Adrian Beltre. For some reason, home plate umpire Alan Porter determined it was intentional and tossed Belisle. The score was already 10-0 at that time. In the eighth inning, Addison Reed got ejected for arguing balls and strikes. The score was 13-2 at that time. I hope Mr. Porter is real proud of himself for entertaining all the people who came out to the ballpark to see him. Gimenez came in to replace Reed, because of course. At least Gimenez provided a light-hearted finish to this game by hitting a two-run homer in the bottom of the eighth. The Twins experimented with the opener today, starting things off with Gabriel Moya. He gave up a two-run homer in the first. Zack Littell came in for the next four innings and gave up three runs, though only two were earned. Oh yeah, the Twins also committed three errors today. Tyler Duffey recorded only one out and gave up five runs (four earned). Alan Busenitz recorded two outs and gave up a run on a homer. Reed gave up a run before he got tossed and the Rangers scored five runs off Gimenez in the eighth. If you ask me, it’s a little bit bush league to have your guys swinging out of their shoes against Gimenez. On the other hand, I guess it’s pretty bush of the Twins to have him pitching in the first place, especially in September when there should be an abundance of arms. Jake Cave was a bright spot for the Twins, as he hit his 10th home run of the season. He’s now gone deep in three straight games and has has six homers in his last 13 games. TEX 7, MIN 4: Is Jose OK? We're back to total system failure, folks. This wouldn't be so surprising if the 2017 didn't happen and we went straight from 2016 to 2018. I'm done with Duffey. Let's see if Jake Reed, Nick Anderson, and John Curtiss have anything to bring to the table instead. We've got room to bring them up. How fun would it have been to watch that game with Jim Pohlad? Can we call up literally everyone doing well? Kiriloff, Wells, Lewis, Stashak, Moran etc. They can't be any worse! Why Jimenez pitching, just why? With the September call ups there were plenty of other arms available. That was a pig show throwing Jimenez out there. The front office lost me today. After nearly 2 years in charge the team has an old back up catcher playing 1B, Grossman with his .700 ops as cleanup hitter and dh and Fields for whatever reason being on the team at all. 2 years to turn this around and that's the kind of garbage we have to watch. Luckily today I took a nap and missed most of it. The TV guys are going no room for Buxton with Cave playing so well, could Cave play LF instead of Field? Guess not. Could Buxton play LF better than Field? Guess not. This is garbage piled on top of garbage. Somebody should get fired! 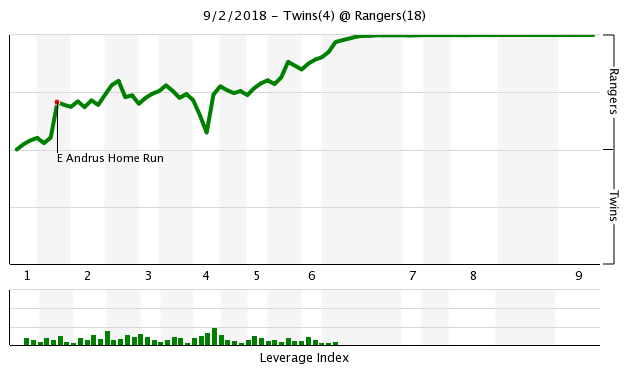 Wow, one of the worst Twins games, ever. Just plain ugly. I didn't like the lineup, I didn't like the "opener" thing, I didn't like the way they played, I didn't like seeing a 35 year old catcher pitching who actually wasn't catching but playing 1B. And Matt Belisle hits Beltre with a pitch throw and the ump thinks he's throwing at him. Ha ha. You would think that before they signed him, Pohlad asked how Belisle's arm is. The doctor should have said, "It's dead Jim". This game was so bad, I was checking the hockey Gopher's upcoming schedule. Where should Cave play in the field? CF seems tough for him. Just mailing it in. The Twins stopped caring at the trade deadline on August 1st. Molitor's lost control of the ship, nobody's going to get this team to play professional baseball until next March 29. Cave and Polanco seem to be the only guys who even care at this point. I'd be embarrassed if I expected anything more from this team. I watched for about 10 minutes and decided my time would be better spent working on a project in the garage. This team isn't even good enough to be bad. At least we know why they traded for Gimenez. He did better than Duffy and Belisle. Maybe one of these games they can randomly choose a pitcher from the stands--couldn't be any worse. What can you even say about this game? —- It’s officially football season. The only question now is where in the 2019 do the Twins draft? And that’s not the first time Molitor has done that this season. So painful I was writing a blog in the second inning - http://twinsdaily.co...whos-at-first/� and then had to amend it because it got even worse. And can we please stop with the opener idea? It’s DUMB! If you don’t have starters that can get through the lineup a 3rd time, maybe they shouldn’t be starters. Turned it off at 8 - 0. Apparently that was a good decision. That's what the New Skool managerzz are doing. Saving an arm during s*** storm baseball games. So this was the exciting game where we had an OPENER - wow, here Littell you are only down 2 - 0.What a joke!Some analytics.The same analytics that have Gimenez on 1B and Belisle coming in.Do not blame the ump for anything, he probably wanted to have a suit of armor back there. Field was our one big bat call up and now has an amazing 196 average. Excellent metrics. :Gimenez managed to reduce our already too low rating at 1B to the bottom basement. Adrianza played 3B so Sano would not drop his BA below 200.Kepler kept his average at 226, but we still think he is good ! ?Tyler Duffey proved that his previous failures were not a fluke and Moya can give up his dreams of being a starter (or an opener).Reed keeps his opposition scoring streak alive. Man so many highlights I cannot go on. It’s not like we don’t have 15-16 pitchers at this point. Regardless, the game was 13-2 when he was brought in. They don't need a real pitcher out there when a game is that lopsided. I agree, it would be pretty foolish to wait until it's 13-2 to bring the real pitchers out. She was enjoying the disaster on the radio a bit too much on the trip home. The problem is that I think you already know how that would go as well.